This is a shield-shaped Wood’s Electrical Farm Equipment porcelain sign. This particular Wood’s Electrical Farm Equipment sign is very colorful. 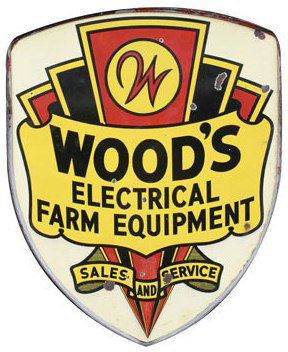 It reads, “Wood’s Electrical Farm Equipment, Sales and Service” in black text against a yellow, red, and green design.